Creatabot is a project that connects, supports and promotes creativity in Medway and beyond. Natasha Steer, maker and Director of Creatabot also runs creative workshops for all ages across Medway and Kent. She specialises in using creativity as a tool to bring communities together and improve wellbeing. Natasha also acts as a consultant in advising organisations that want to build bridges in the local community. Creatabot was set up by Natasha Steer in November 2010 and is run from her studio in Kent. Natasha was previously Editor of the South East hub of Creative Boom, which continues to be a successful online creative industry magazine. Having through Creative Boom connected with the local creative community, Natasha decided to set up her own website that concentrates solely on creative individuals rather than creative industry as a whole. Being a craftswoman herself, she feels that support and inspiration helps to motivate creative people and adds to their success. She now works as a catalyst helping to support creative people and spaces. 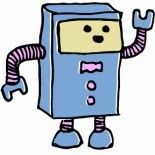 Disclaimer: Creatabot relies on the kindness of writers and contributor’s for its articles. Although we try to monitor content as much as possible, Creatabot cannot be held responsible for content of articles. If you have an issue with an article please contact the author directly.